The story of the U.S.S. Michigan begins in Erie, Pennsylvania. On her launch day, December 5, 1843, the Navy gunboat U.S.S. Michigan became stuck on the ways in the harbor at Erie. Most of the Erie populace had gathered to see her go straight to the bottom. They knew she would sink because she was a first in the shipbuilding industry of the 1800s- she was made of Swedish wrought iron. The United States Navy had become painfully aware of the fact that a new kind of ship was needed during the Canadian Rebellion of 1837. Attacks on Canada from the United States by bands of rebels (or patriots, depending on which side of the lake you favored) motivated the British government to build two steam gunboats to defend the Canadian side of the Great Lakes. Understandably, the United States didn't like the idea of a gunboat on the Great Lakes. The British move was so unpopular that Secretary of State Daniel Webster sent a protest to the British Minister in Washington. The British reply bristled. "It being unfortunately notorious that her Majesty's provinces are threatened with hostile incursions by combinations of armed men, unlawfully organized and prepared for war within the frontiers of the U.S. and it being found by experience that the efforts of the United States government to suppress those unlawful combinations are not attended with the wishes for success, the vessels are obviously necessary to protect Canada." This reply did not turn away the wrath of Mr. Daniel Webster of the United States. In 1841, Congress earmarked $100,000 for the construction of armed vessels on Lake Erie. The Michigan's construction proceeded slowly in 1842 and1843. She was designed by naval constructor Samuel Hart and built in sections at Pittsburgh. Contractors were Stackhouse and Tomilinson and her specifications were drawn according to an agreement between the United States and Canada. Many of the ship workers who helped build her sections were also positive her wrought iron hull would sink her. The Michigan's engines were another dubious first and radical departure from the tried and true. She carried two direct acting condensing steam engines, later placed side by side. The cylinders were 36 inches in diameter with an eight foot stroke. She had two iron boilers that were to last for 50 years. The various sections of the U.S.S. Michigan were built in Pittsburgh and made ready for assembling. Then they were sent to Cleveland for additional work and transported back to Erie overland through the forest by ox teams. The work of putting the ship together took place at the foot of French Street in Erie. When she was finished, the U.S.S. Michigan, the first U.S. Navy iron-clad, was an impressive sight. She was 168’ long, had a 27' beam, 10' draft and a displacement of 600 tons. The iron strakes that made her body averaged only 18" in width. Tradition says they were bent into shape with wooden mauls in a bed of sand. The Michigan's frames were wrought iron and she was rigged as a barkentine, carrying sails as well as wood for her boilers for propulsion. Her crew could lock her paddlewheels and unstop two of her paddlers whenever she was sailing but her engines could be reversed only by lifting the valves by hand, using a ten foot crow bar. Even a strong man could do this no more than eight of nine times in a row. This ensured that the Michigan didn't back up too far or too often. The builder, Samuel Hart, watched his creation proudly as she poised to slide into Lake Erie on that December day in 1843. Then his pride turned to embarrassment because she stuck on the ways and could not be moved backward, forward or sideways. The onlookers grumbled impatiently. After all, they had come to see the U.S.S. Michigan sink. After a few hours of watching the dock workers sweat and struggle to launch her, the spectators gave up and went home. The next morning, Mr. Hart and some of the workers came back to the dock, crowbars in hand, to have another tray at launching her. They were stunned. There she sat already launched and floating serenely. During the night the blocking had given way and the Michigan slid down the ways all by herself and drifted over in back of a warehouse. The U.S.S. Michigan had launched herself. As she sailed out onto the lake, the U.S.S. Michigan was indeed a handsome sight with her clipper bow, three tall raking masts and a tall smokestack. In her first years of Great Lakes life, she was painted black to the top of her gun ports with a white stripe along the bulwarks. Her draft was kept to nine feet so she could use most of the small harbors on the Great Lakes. Because of her draft and the then limited knowledge of metal construction, her hull was flat-bottomed like a box in the cross section. This combined flat bottom, shallow draft and large upper works made her at times hard to handle. One old quartermaster was asked why he kept moving her helm from side to side while she was on a steady course. He said, "You have to keep her confused so she won't take a sheer." With its original $100,000 appropriation, Congress had planned to launch several armed vessels on the Great Lakes, but the U.S.S. Michigan turned out to be the only armed vessel launched. The Michigan's real duty was to maintain order in American waters, not to fight the British. However, she became the subject of verbal confrontations with the British, partially because of her armament - originally four 22 pound cannonades and two 68 pound pivot guns, all smoothbores. The American press duly reported the state of arms of the Michigan and the British were outraged. The British Prime Minister in Washington made an official protest to the U.S. government that this armament far exceeded the provisions of the Rush-Bagot Convention established after the War of 1812. They conveniently ignored the fact that two British gunboats had trigged the whole Michigan building spree. But after two wars with Great Britain, Americans wanted peace. The Michigan was commissioned on August 9, 1843. She self-launched on December 5, 1843, and was outfitted and completed the following year. She made her first Great Lakes cruise in 1844, with a crew of 106 men and was captained by William Inman who sailed with her until October 1845. In 1845 Captain Stephen Champlin, who was reportedly a cousin of Oliver Perry, took over as her skipper. Captain Champlin sailed the Michigan for three years and after him came 37 other commanders. These commanders included Oscar Bullus, Mr.Biglow, Mr. McBlair, Mr. Nicholas,Joseph E. Jouett, George Brown, James Billis, Mr. Wright, Charles Cashman, G.W.Hayward and Albert Kautz. The last was Lt. Commander William L. Morrison of Erie. The captain and crew had comfortable quarters on the U.S.S Michigan. Shortly after the launching, the cabins and deck houses were rebuilt. A large pilot house was built for navigating and chart preparing; the bridge above was covered with awnings. Bridges extended over the paddle boxes amidships. True to the traditions of sailing ship days, the captain's cabin was aft on the main deck and consisted of a lounge with table, desk, and library, two staterooms and a bath, all paneled in dark woodwork. The sailors called this part of the ship "the holy of holies" because only the high ranking officers were permitted there. Young graduates of the naval academy at Annapolis vied for assignments on the Michigan. She became known as the mother-in-law of the Navy because many of her young officers married Erie girls. The arrival of the officers and their families also injected new life into Erie social circles. Despite the fact that she was a Navy ship, the U.S.S. Michigan had a peaceful career. Only four incidents in her long life involved American wars. The first happened just before the Civil War when she broke up a Mormon Colony on Beaver Island in Lake Michigan. The Colony was ruled by King James Strang, "A New York lawyer." and it was a thorn in the side of local authorities. Strang's subjects were soon fighting among themselves and the Michigan was sent to the island empire to keep peace. The second incident happened during the Civil War. Confederate refugees in Canada captured the passenger steamers Philo Parsons and Island Queen, near Sandusky, Ohio. They intended to capture the Michigan as well and turn her into a pirate ship to prey on lake shipping and ports and use her to free the Confederate prisoners held on Johnson's Island in Sandusky Bay. The scheme failed and the Michigan ended up chasing the captured steamers into the open waters of Lake Erie. They eventually escaped. The Michigan's third near battle happened during the Fenian invasion of Canada in 1866. A group of 1,000-1,500 raiders gathered at Buffalo, New York, pretending to be laborers bound for the west. Their modest objective was to capture Canada. With their green flag flying they crossed the Niagara River at Black Rock and took over the ruins of old Fort Erie on the Canadian shore. Advance scouts and hidden arms at Fort Erie and these were given to the raiders as they came ashore. All of this happened without the knowledge or consent of U.S. officials, but the Canadians soon found out about the raiding party and hastily raised an army of volunteers to repel the invaders. In the resulting battle, the Fenians were dispersed, retreated to the river bank and headed back to Buffalo. The Michigan steamed to the scene and took the invaders prisoners of the government. The final incident occurred during the Spanish American War while the Michigan served as a recruiting center. The first detachment that left the Michigan for service in different ships was: Lt. Bilisch; boatswain's mates, Bailner, Wilson, Burns, and several seamen. More than 5,000 men left from the Michigan. When Emmett Bean left the Michigan crew, Mrs. Bean carried her eight month old son to the station to bid her husband goodbye. That baby grew up to spend 30 years in the army. The Memorial Day celebration in Erie in 1898 involved the Michigan. Patriotic feelings swept the town. Sailors from the Michigan and Captain Gridley from Erie were on hand. Captain Gridley was the captain of Admiral Dewey's flagship Olympia. All of Erie's many brass bands turned out in colorful uniforms. The replacements from the Michigan and those from the national guards were in line in their brand new uniforms. The place of honor went to the old veterans from the Soldiers and Sailors Home. The Grand Army of the Republic, hundreds strong, proudly marched in line. Many of the men wore their black campaign hats and uniforms. They were led by Volney B. St. John, then commander of the G.A.R. Cheering crowds lined the streets as their favorites passed by. This was also a time of anxiety. Victories were being won daily but the casualty lists were also growing. There was talk of draft and many anxious parents prayed for the end of hostilities. The Civil War had ended but 33 years before and visions of the frightful casualties of that war were still fresh. One of the most famous commands in battle involved Captain Gridley of Erie and Admiral Dewey. At the Battle of Manila, Admiral Dewey ordered, "When you are ready, Gridley, fire." Captain Charles Gridley, a former Michigan officer and the husband of an Erie woman, commanded Dewey's flagship Olympia in that battle. The Spanish fleet was annihilated with over 2,000 men killed and wounded and property loss by capture and sinking reached $6,500,000. Tradition has it that the Michigan was also indirectly responsible for providing the medical world with a living example of working human digestion. She was cruising between the Les Cheneaux Islands when the famous French Canadian woodsman was brought for treatment to the ship's doctor at one of the ports of call. His abdomen had been accidentally pierced and healed with an opening that led his digestive organs visible. The wounded man, Alexis St. Martin, was brought aboard the Michigan and taken to Mackinac Island where his abdomen was studied and noted by the equally famous Doctor William Beaumont, the army post surgeon stationed there. Dr. Beaumont was known for his early and remarkable discoveries in intestinal surgery and gastric digestion. His professional records stand as medical classics. Dr. Beaumont studied the digestive system of Alexis St.Martin for years and Alexis St. Martin survived him by twenty years. In 1902, the navy re-christened the USS Michigan the Wolverine and she served as a training ship for sailors in the Spanish American War and World War I. The Michigan enjoyed many adventures on the Great Lakes, but she always returned to her home port of Erie, Pennsylvania. The return of the Michigan to her dock in Erie always brought the city to life. In November of 1893, the Michigan returned from Chicago on a dark, drizzly and dreary day. Pedestrians hurried along the streets wrapped in great coats buttoned to their chins and collars turned up to their ears. The rain continued until 11 o'clock and mixed with snow. A rumor went around that Mayor Scott was ill and could not participate in the reception. The Michigan arrived early. It had been the intention of the Michigan's commander to remain outside the peninsula until 2:00 to await the reception committee, but the wind was so high that she slid into the harbor at 11:30 and cast anchor a little way out from the public dock. Her arrival was announced to the astonished citizens by the wild hooting of whistles. From the time the ship arrived until 2:00 o'clock, a steady stream of people had been marching down State Street. When the band and reception committee reached the dock, they found several thousand people. Erie always loved the return of the Michigan. When the Spanish American War ended, the Michigan went back to her pre-war duties on the Great Lakes with full crew. She was berthed in the West Slip at the foot of State Street where Erie people could look across the bay and see her-white, with her shining brass and the neatly trimmed lawn adjacent, her picturesque crew marching in all of the local parades in blue uniforms and white leggings, drawing her little Gatling gun after them. The gun was always pointed out as the most destructive weapon of war ever invented. The lawn of the Michigan’s berth was kept neatly trimmed in summer. Many visitors walked or rode down State Street in Erie to look over the ship and visit with members of the crew. In winter sailors kept the ice clear of snow for skating. The crew was a jolly lot and all sports minded. In the summer they had an excellent baseball team. When the ship was on a cruise, the team was in demand in all the ports for games with the local teams. The football team was comprised of a bunch of huskies and they had a bear cub mascot. On July 15, 1902 the Michigan was involved in an unfortunate accident that foretold her future. Moored at her dock in Erie, she was rammed by a heavy freighter, the M.B.Grover. The Michigan sustained $15,000 damage. This time the Navy repaired her and gave her a new name, Wolverine. A new salt water battleship had been named Michigan and the Navy didn't want confusion. A notice in a local paper, The Union City Times, published in a small town outside of Erie, reveals the influence of the Michigan, even inland. Dated October 3, 1905, the notice says that Charles Kern, recruiting agent for the U.S. Navy attached to the man of war Wolverine, now in her winter quarters in Erie Harbor, was in Union City last Thursday. Mr. Kern was looking up recruits in mechanics of map reading, all grades of seamen, firemen, coal passers, others. The men were wanted immediately to fill up the complements of the Wolverine. The applicants, he said, must be between 17 and 35 years old and the pay ranged from $10 to $70 per month and board, according to ratings. 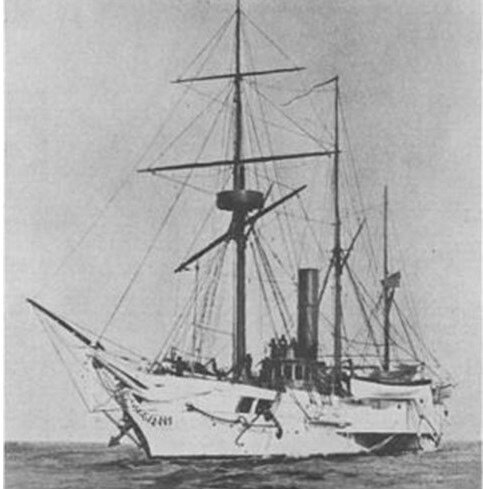 In 1910, the Navy loaned the Wolverine to the State of Pennsylvania for use as a training ship for the state naval militia, Captain William Morrison in command. Many future sailors and officers received their initial training on the Wolverine. The ship remained in this capacity until the beginning of World War I in 1917 when she was returned to active duty. Even as the Wolverine, she continued to make history. During July, August and September of 1913, which was the Centennial celebration of Perry's victory in the Battle of Lake Erie, the Wolverine was busy. She towed Perry's ship, the Niagara, which had been raised and rebuilt. The two venerable ships went on a like cruise to Great Lakes ports. The two old battle wagons were manned by mixed crews regular Navy and naval militia. Hundreds of thousands of people viewed the two vessels in their voyage with celebrations at all the ports of call. Approaching World War I, the Wolverine was again active as a training ship. Hundreds of sailors watched their city skylines fade into the distance from her decks. Three days after the United States actually entered World War I on April 7, 1917, Captain Morrison and his men left for Philadelphia where their unit was broken up and the men transferred to different ships. The boys from the Wolverine saw service throughout the world, scattered on many vessels. When the war was over the old ship resumed her career as a training ship. Captain Morrison went back into command and she made periodic trips up the lakes until 1922 when crews were sent to Erie from Philadelphia for training. Some of them were reserves, others from the regular Navy. During one of the trips disaster struck the Wolverine. On August 12, 1923, steaming through the Straits of Mackinac, returning from a training cruise, she broke a port engine connecting rod. The crew made temporary repairs and discovered that she could run under her own power at about five miles an hour. Later that same night a storm blew up on Lake Huron and the crippled Wolverine had to shelter at Harbor Beach, Michigan, until noon the next day. Then she continued to limp home to Erie, sailing into the harbor unassisted. Although her engine was repairable, funds weren't available. The Wolverine's career was over. A caretaker came aboard, but she gradually showed the signs of neglect. In January 1927 there was a movement afoot in Erie to have the Wolverine turned over to the Boy Scouts of Erie County, who would arrange to have the boat taken from its present moorings at the public docks across the bay to the state park on Presque Isle Peninsula where a mooring place could be provided. The Scouts would then see that she was kept open year around for visitors. She could also be turned into a training ship for Sea Scouts or be made into a museum and a meeting place for the Boy Scouts, the Naval Reserves, and other groups. Later, the War Department through the action of Congressman Milton W. Shreve, turned the Wolverine over to the City of Erie. Erie loved the ship, but did not have the money to take care of her. The city council decided to let her go to some other port. Finally, her last commander, William L. Morrison, and another Erie sailor, Captain P.D. Grant, arranged to have her towed to Crystal Point in Misery Bay. With the aid of the tug Commander Perry, the Wolverine was towed there on November 23, 1928. She was supervised by the Presque Isle State Park Commission and guarded by the police to protect her from vandals. But the police could not stop the ravages of time and dry rot attacking the Wolverine’s decks and cabins. She floated in a few feet of water. The broken connecting rod hung where it had fallen during her last cruise. The galley ranges, iceboxes and store rooms were thick with dust and the white tile floor in her once spotless galley showed in patches through a blanket of dirt. The ports no longer housed her once bristling guns. Different groups of civic and military organizations made repeated attempts to raise enough money to purchase the Wolverine from the Navy and restore her. They all failed. Time and dry rot prevailed and the Navy finally condemned the Wolverine. She was sold to the Foundation for the Preservation of the Original USS Michigan, Inc., on July 19, 1948.Fundraising efforts failed to raise enough money for her restoration and preservation, and she was cut up and sold for scrap in 1949. The Wolverine was sold for scrap in 1949, 106 years after her self-launching in Erie. The money made from her sale was used to erect a plaque in Erie in memory of the warship that never fired a hostile shot, but kept peace between the United States and Canada. Some parts were sent to lake ports where she formerly berthed. In 1950, the prow of the Wolverine was erected outside in a park on State Street in Erie, Pennsylvania.Museum where it is currently displayed. The head boards and wheel of the Wolverine are in the Erie Maritime Mjusem on permanent loan from the Marine's Museum in Newport News, Virginia. Mooney, James S. Dictionary of American Naval Fighting Ships. Department of the Navy, 1991. Moore, John E. Jane’s Fighting Ships of World War I, 1990.